So it seems I’m slowly being converted out of my anti-biscuit baking funk by some contributors and their awesome recipes. My old uni friend Katherine has sent in this fantastic contribution – cookies with just two ingredients + whatever mix-ins you might like. 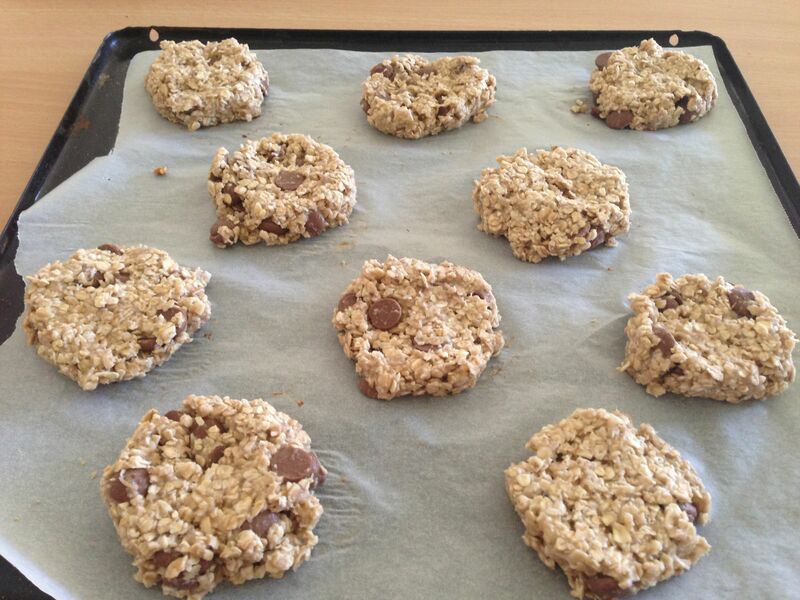 There’s so much to love about this recipe: no butter, no eggs, no refined sugar, minimal mixing, less than 5 minutes prep before they go in the oven, they’re much healthier than their mainstream counterparts, they taste terrific and the oatey substance of them is so homely. But since this is a blog about easy and affordable hospitality, I should mention too that they’re a great option to make for last minute guests who drop in (no rolling mixture, just dollop the mixture on the trays using 2 dessert spoons), a yummy addition to a meal provided for folks in need or freezing in advance for the never-ending stock needed for healthy school lunches. Originally from a terrific blog called The Burlap Bag – all credit is given to its author, Lauren who invented these. Using the quantities listed below, with choc-chips used as my mix-in of choice, these little babies will cost you no more than $6 to make 40+ cookies and less if you get bananas cheaper than $3/kg. Thanks for sharing, Katherine and thanks for inventing, Lauren! Mix ingredients together. Old bananas are amazing for this, but you can use fresh ones too. I buy a bunch of bananas, let them get old on my counter, giving the family the opportunity to eat them and then stick what remains in the freezer – whole with the skin on. Lauren’s tip: Since all bananas are different sizes, the needed measurements can vary. 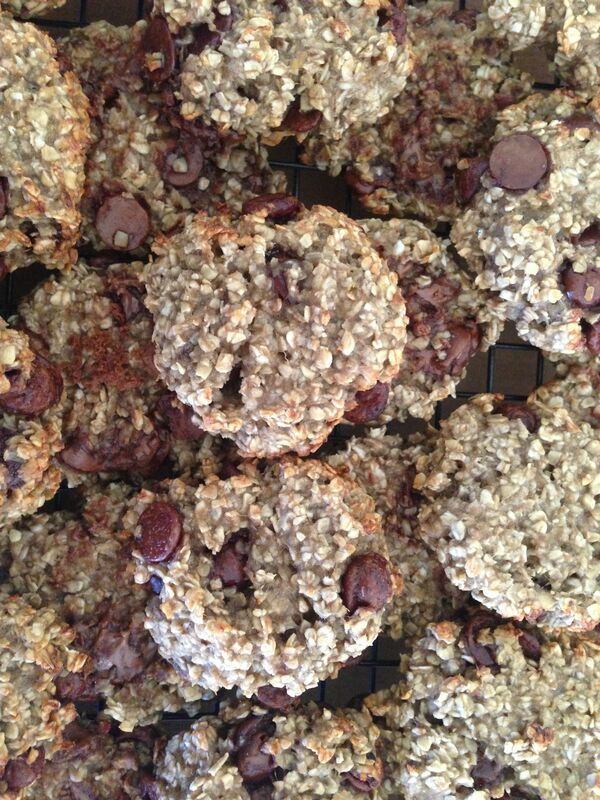 If it seems too runny and the cookies would flatten out too much, add in more oatmeal. 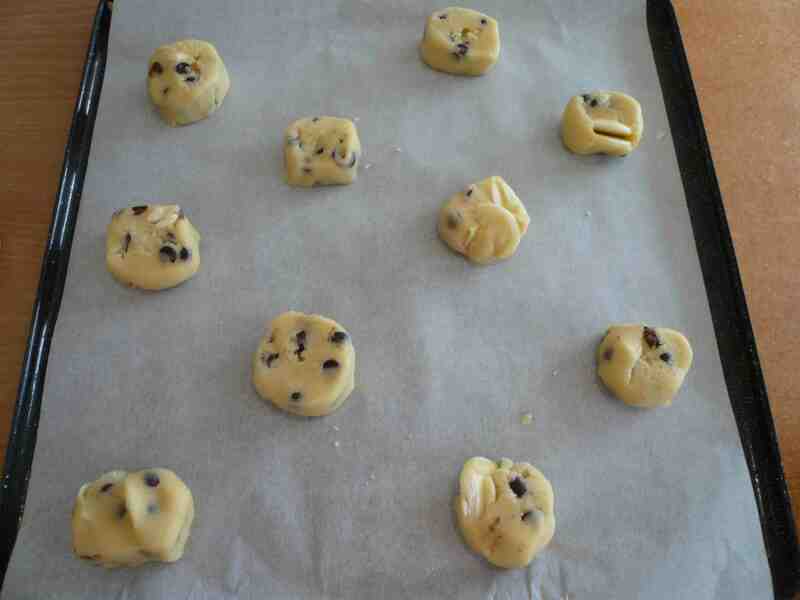 And make sure to not add in TOO many mix-ins as the cookies won’t hold together very well. Dollop onto trays using dessert spoons and flatten before baking with a fork. Bake in a moderate oven for around 15 mins. Enjoy! In general, I don’t really like baking biscuits. 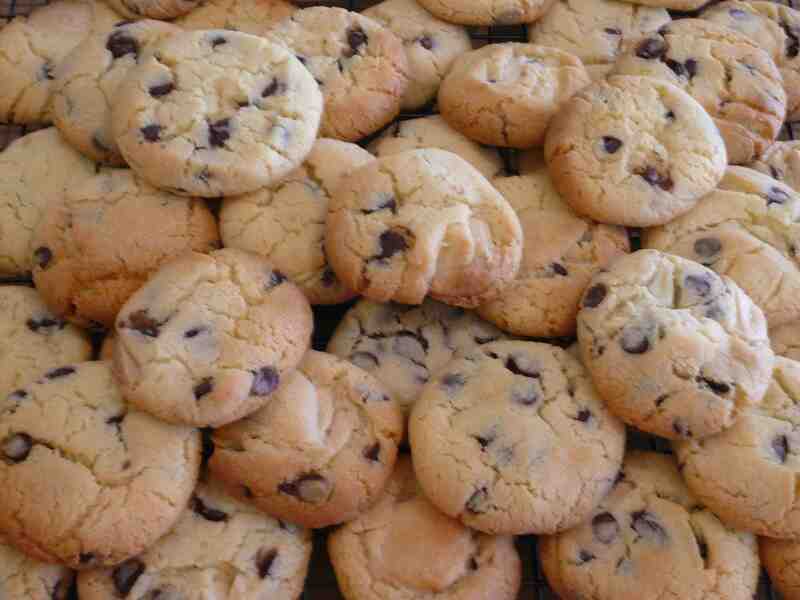 I do love the taste of a chewy homemade chocolate chip cookie, but just the thought of repetitively rolling teaspoonfuls of mixture into little balls and cycling tray after tray through the oven, is enough to make me flip-out before I even begin. But when my friend Cathy sent this recipe the other day, I was forced to reconsider my anti-biscuit position. The recipe that follows does away with rolling balls of mixture (yay!) though you can still do that if you prefer, and is made in super-sized quantities that fit the bill for multi-purpose cooking (individually wrapped for school lunches, supper for Bible study, morning tea when cooking for a camp or just for filling the household cookie jar). Along with all these things, I fell in love with this recipe because each of the logs of uncooked cookie mixture can be wrapped in plastic wrap and frozen for emergencies. 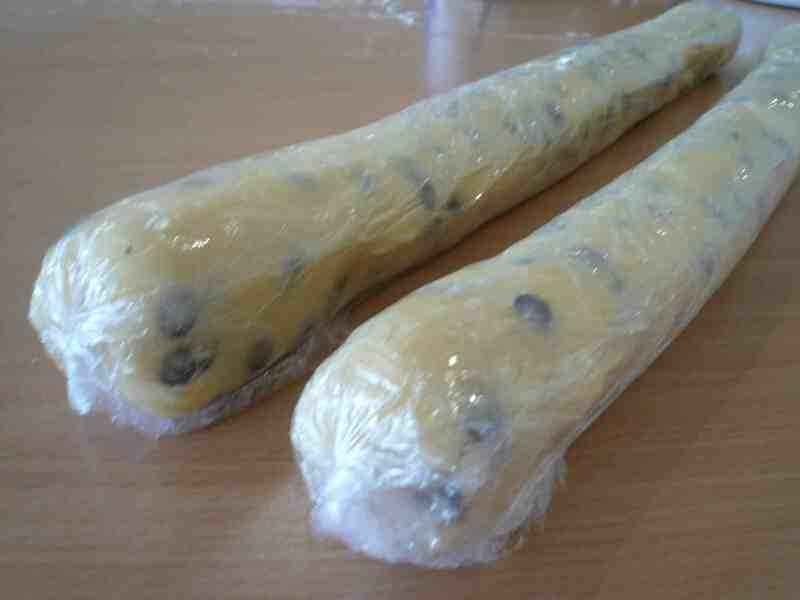 Simply thaw the log out on 50% in the microwave, cut into rounds and bake for 10 minutes in a moderately slow oven. When I trialled this bumper cookie recipe, I chose to bake half the mixture into 48 biscuits, and freeze the other half in two logs for whenever I need them next. Using Nestle chocolate melts, this recipe, that costs no more than $12 to make (even less if you use homebrand chocolate) works out at just 12 cents per cookie and has definitely softened me up when it comes to biscuit baking! Using an electric mixer or beaters, cream butter, sugar and condensed milk. Mixture perfectly fits 5L mixing bowl. If yours is smaller than this, use a plastic all-purpose bowl, readily available in laundry section of the supermarket. Stir in flours until combined and then stir in choc chips. 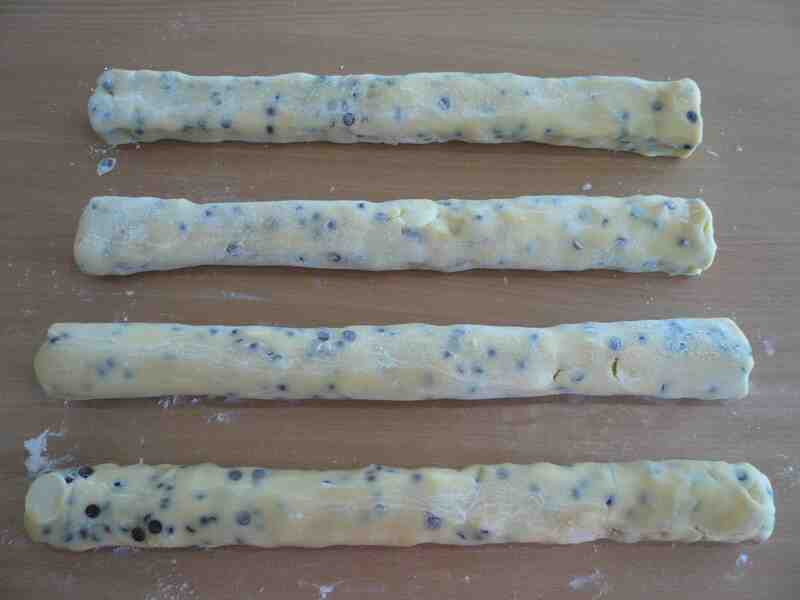 On a floured bench top, divide mixture into four equal portions and roll into evenly shaped logs. Each log makes 24 biscuits, so starting in the middle, with a knife, cut the log in half leaving two portions to make 12 biscuits from each. Cut each section again to make 4 portions which will make 6 biscuits from each. Again, cut each of the four portions in half again, which will make 3 biscuits from each. Finally, cut each of these smallest portions into three equally sized rounds. Repeat the process for each log. This ensures evenly sized biscuits and production of exactly 96 biscuits. Roll each portion into balls, or do as I do and just place the cut up rounds straight on lined oven trays. For a crunchier biscuit bake until golden for around 12 minutes, and if you prefer a chewier cookie, cook for no longer than 10 minutes and remove from oven while still a little pale. Cool on tray or wire rack.